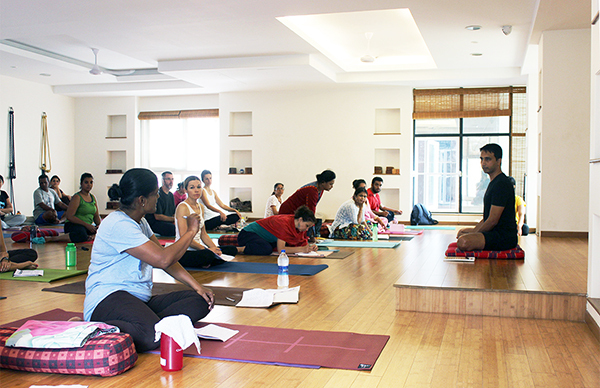 The Prenatal Yoga course at a1000yoga Academy is designed by experienced yoga teachers and Health care professionals. This course is registered under the Yoga Alliance, USA’s RPYS (Registered Prenatal Yoga School). The course sheds light on the physiological and psychological changes and needs of a pregnant woman. It enables the Yoga Teachers to modify the yoga practice to suit the needs of the pregnant woman based on the trimester she is in. The course also provides knowledge of pre-conception and post natal practices that aid in the over all well being of the practitioner. Complications like miscarriage, premature labor etc are also covered in the course. This module is designed to enable Yoga Teachers to modify the yoga practices as per the needs of the pregnant woman based on the trimester. The course also provides knowledge of preconception/postnatal practices, specialised breathing techniques, Yoga Nidra and Meditation to aid in the overall well-being of the practitioner. This module enables students to understand trimester wise prenatal anatomy and physiology, which assist a teacher to design a yoga session with the right modification, sequence, contraindications and intensity, to meet the specific needs of the prenatal practitioner. Knowledge and first- hand experience of teaching Prenatal Yoga in a safe and enriching manner. Ability to design a yoga session with the right modification, sequence, contraindications and intensity to meet the needs of the prenatal practitioner. Specialised breathing techniques that can be used during labor. Use Yoga Nidra and Meditation for creating a positive mindset during pregnancy and labour. 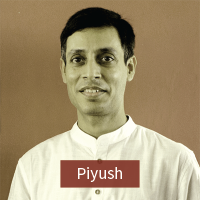 Bincy Subash is an internationally trained yoga teacher – SYS 250hrs and 300hrs. She is also certified in Vinyasa Karma Yoga ATTC 100hr (Advanced Teacher Training Course) under Srivatsa Ramaswami, a direct disciple of Sri. Krishnamacharya. She is a science graduate and has worked in various fields such as event management and marketing. She has been practicing Yoga for the last nine years and has been a Yoga teacher for the last five. For her Yoga is not just about asanas or breathing, it is a way of life, it is a journey. Practicing and teaching yoga gives her immense happiness and satisfaction. She feels that she is able to spread that happiness to others while teaching yoga. Specialising in Hata Yoga and Pre-natal Yoga, Bincy also teaches Power Yoga, Hata Vinyasa, Core Hata, Therapeutic Yoga and Shatkarmas. 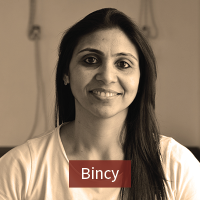 Bincy is a trained Bharatanatyam dancer and passionate about baking. She hopes to spend the rest of her life teaching Yoga and sharing the positive energy with her students. She believes that there is always something to learn from each and every student as each one is special and different. SYS250, RYT300, RPYT, VINYASA KRAMA YOGA ATTC 100HR.